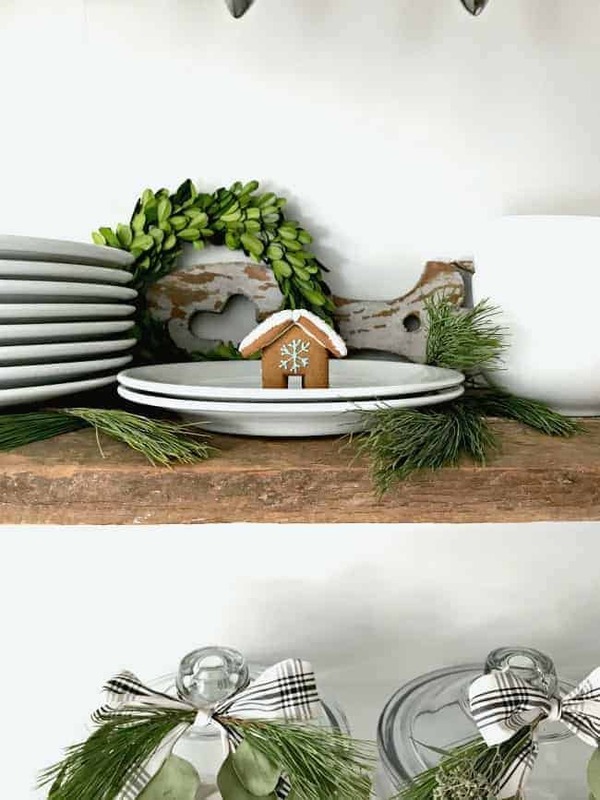 I never thought I’d be this excited to share our cottage Christmas kitchen but, yup…I am. This kitchen has quickly become a favorite space in our little cottage, and that’s even before we’ve done any updating. I think it’s the openness and that big beautiful window. It just really draws you in to the space. I tried to keep it simple, as far as holiday decor goes, and I’m loving how festive it feels (even without using red). 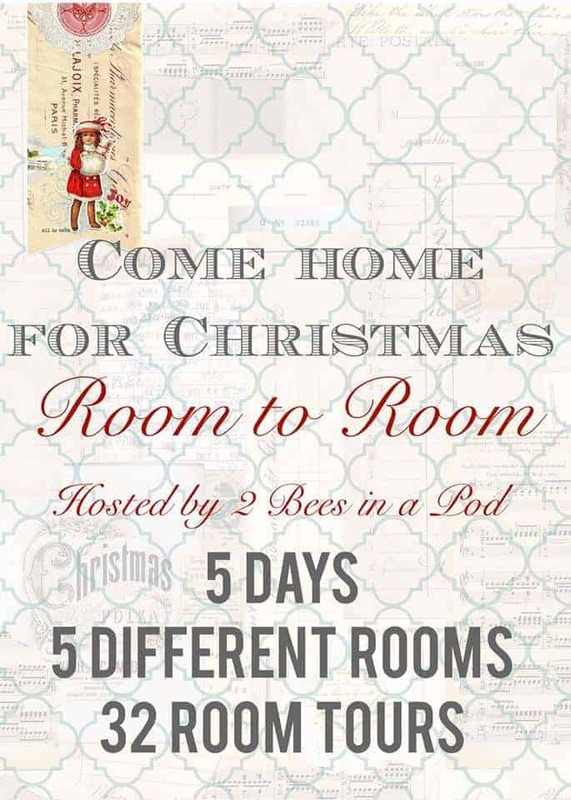 I’m so excited to be joining 2 Bees in a Pod who are hosting the Come Home for Christmas Tour. Each day this week a different room was shared by a group of talented bloggers. Today is the last day, and it’s all about kitchens, but you can check out the links at the bottom of the post and visit your favorites. You can also find a source list for this space at the end of the post. We haven’t done a lot to this space since we moved in but it really feels like “us”. Probably more than any other room. Yes, the cabinets need to be replaced, as well as the countertops, but just painting the window black, hanging my Farmers Market sign (that I made, here) and adding decor that means something to us just makes it special. I love dressing the big window over the sink and even tried my hand at making a magnolia leaf garland, here. You can see that the leaves have already started to dry and curl. I always thought that you had to have a big beautiful space with top of the line appliances, marble countertops and a 10 foot island but this kitchen has definitely changed the way I feel about that. This little area of the kitchen was my least favorite when we moved in. There was a cabinet hanging on the wall with a very dusty built-in wine rack (you can see how it looked before the transformation, here). It didn’t take me long to rip it down and add 2 simple barn wood shelves. Now we store our everyday dishes here so they’re always within reach, and it freed up a little bit of cabinet space for food (since we don’t have a pantry). Now we really love this area, and it was so fun to decorate. The island in our kitchen is a big favorite in our house. When we were buying the house we fought long and hard to keep it (apparently the sellers loved it too). We think that it was custom made and put together right in the house. The only modification we’ve done is a quick coat of paint. I love it and it’s the hardest working piece in this small space, giving us storage as well as a large work surface. Most of the greens I used are real, and right from the yard. I did tuck a faux stem in here and there but it’s hard to tell which is which. I think you’ve seen just about every inch, at every angle. Thanks so much for touring our cozy Christmas kitchen space. What about you? Have you started your holiday decorating yet? 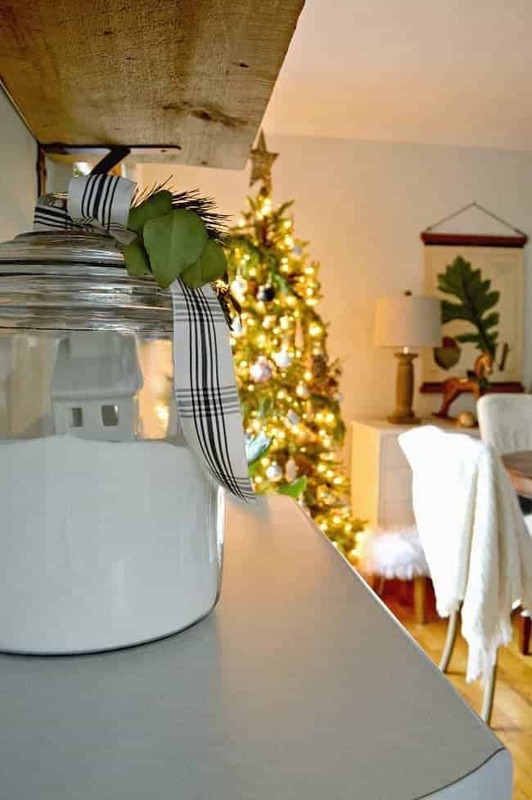 Make sure you check out the other blogger’s holiday spaces. They’ve been sharing them all this week. You can also check out the dining room that’s all decked out for the holidays, here. Marble has nothing on that stunning window! The changes y’all have made so far are lovely! I am so in love with your magnolia leaf garland as well as all the other fresh greenery. And the little mini gingerbread houses are adorable! Thanks so much for touring our Christmas kitchen. Merry Christmas! 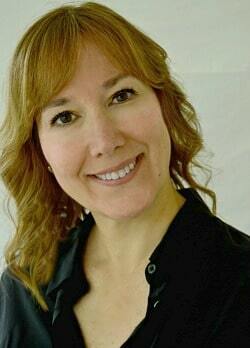 Hi Joanie, welcome!!! I’m so glad you found us and liked our kitchen window that I painted this past year. It ended up taking a lot longer than I thought it would but I love how it, and the dining room window, turned out. Thanks so much for stopping in and taking a look around. I love hearing stories from my readers so I’m thrilled that you shared yours. Happy Holidays! Your magnolia garland is perfect draped across that giant picture window! So pretty! This might be my favorite kitchen! I wouldn’t mind washing dishes if I had that amazing window to look at! So lovely and cozy! Happy Holidays. Awww that is so sweet, thanks so much Kristy! We really do love our space. Everything is so pretty! I would have fought for that island too, as it is perfect for the space and beautiful. 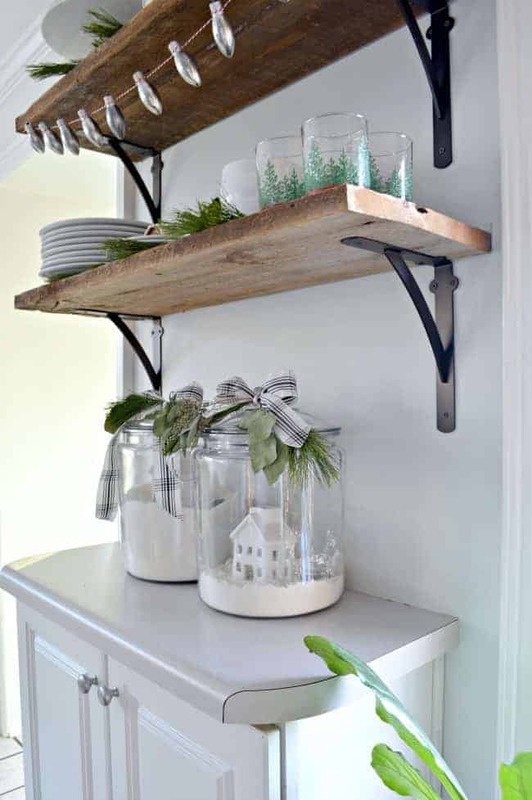 I love the style you have incorporated in your kitchen so far and all of the Christmas touches are so pretty! Those little gingerbread houses are the cutest!!! I would have fought for that island, too! It really is beautiful! 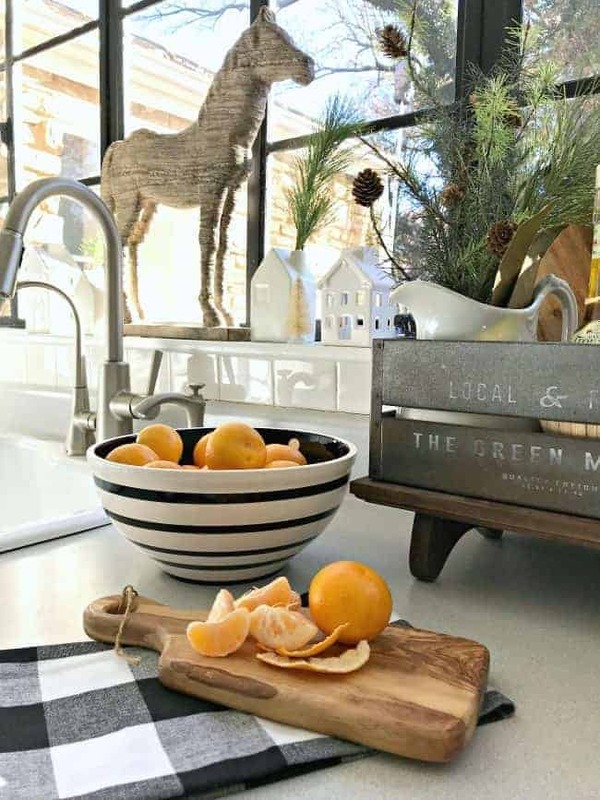 I like all of the natural green elements you have in your kitchen. I think that might be what I add to my kitchen decor (all I’ve done is pop a sign on top of the shoe bench thing). So festive without being over the top! Thanks Bre! I love to use greens whenever I can. It’s easy decor that I don’t have to store after the holidays. Perfect when you live in a small house. 🙂 I appreciate your visit. Happy Holidays! I love that you shared your kitchen! It is beautiful!!! Thanks so much Lindsay! 🙂 Happy Holidays to you! Thanks so much Kristi, I appreciate it! Happy Holidays! I’ve told you over and over how much I love your cozy home and it’s even more charming now that you’ve put Holiday touches on it. Like one of the people who commented above, I fantasize about living there – it’s just what I would want for myself. I also agree that a lovely house doesn’t have to have expensive finishes and brand new appliances. It’s what’s in the hearts and minds of those living there that make it a home. You should be proud – it’s wonderful. Thanks so much for your sweet comment Pat. I am enjoying our holiday decor more this year. I made sure to block out time to just spend on Christmas decorating (no other projects allowed). I haven’t been able to do that in 2 years. Because I put my other projects away for now, I’m able to sit and enjoy it more (well, I don’t sit for long but I still enjoy it 😉 ). Thanks for visiting Pat. Hope you have a great Sunday! I love the gingerbread houses too. I probably won’t eat them though (I don’t have the heart). An island sounds like a great idea. I thought we would sit at ours more but we hardly ever do. I love it for prep space though (and crafting). In my other fantasy life where I live by myself (something I would probably actually hate full time) I live in a sweet clean little house and the kitchen would feel like yours. 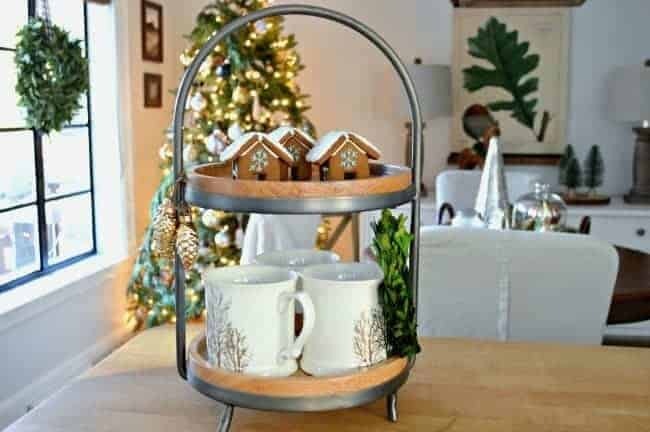 I would look out the wonderful window while I cooked only the things I loved and no one would leave knives in the sink…:) Love the holiday look and that was so clever to put the greens in the chimney. The greens are perfect in your cottage kitchen. All kitchens should have a large window! 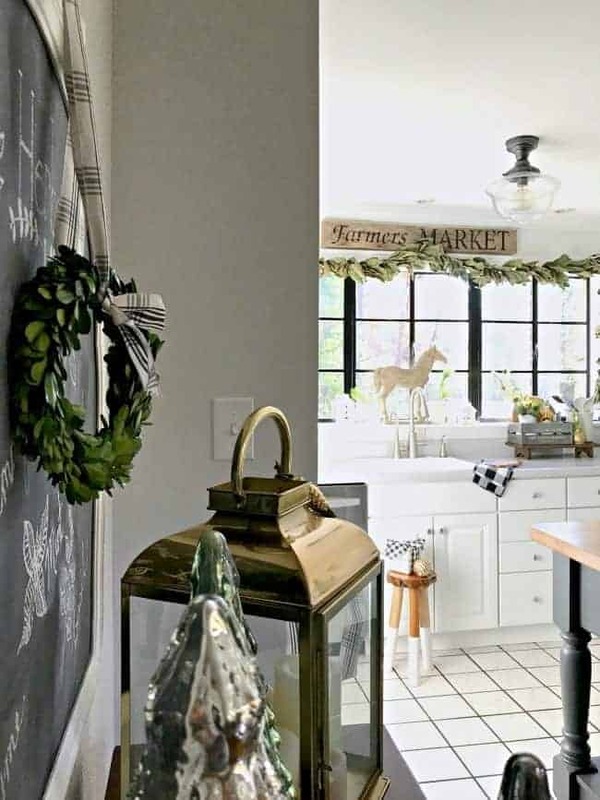 Kristi, your cottage kitchen is just so charming! I love how to added Christmas to the nooks! 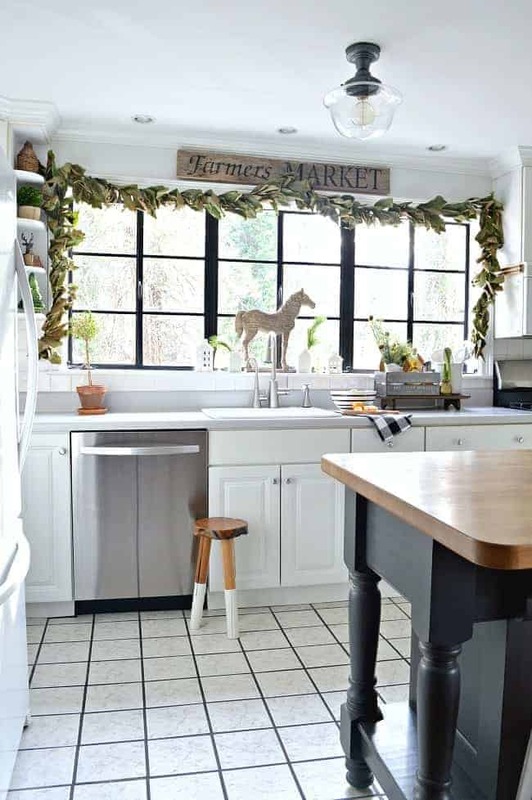 Those open shelves and that large window… beautiful! Thanks so much Coco! I love those little gingerbread houses, too. They are supposed to sit on your teacup (to eat, of course) but I don’t have the heart to eat them. 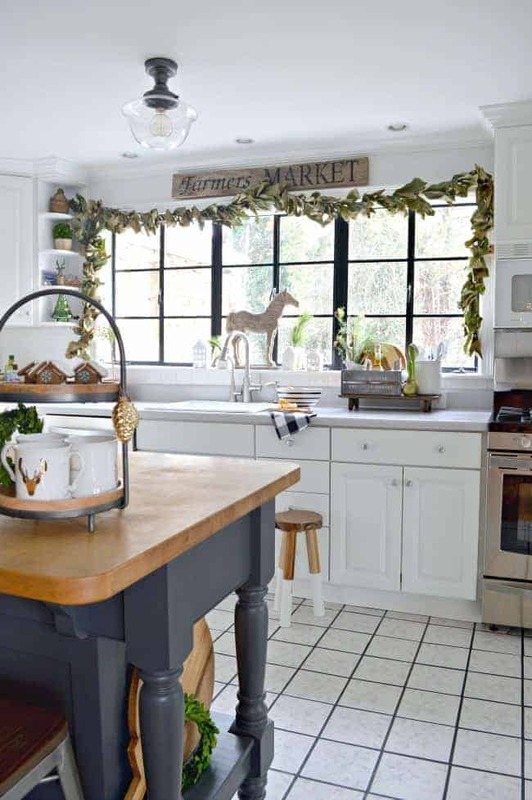 Your kitchen has always been my fav and now I love it even more with how you’ve decorated it for Christmas! This is gorgeous and I love your garland on your window! Awww thanks so much for your sweet comment! I actually enjoyed decorating this space for the holidays this year (a huge surprise, but a good one). 😉 I appreciate your visit. Happy Holidays! 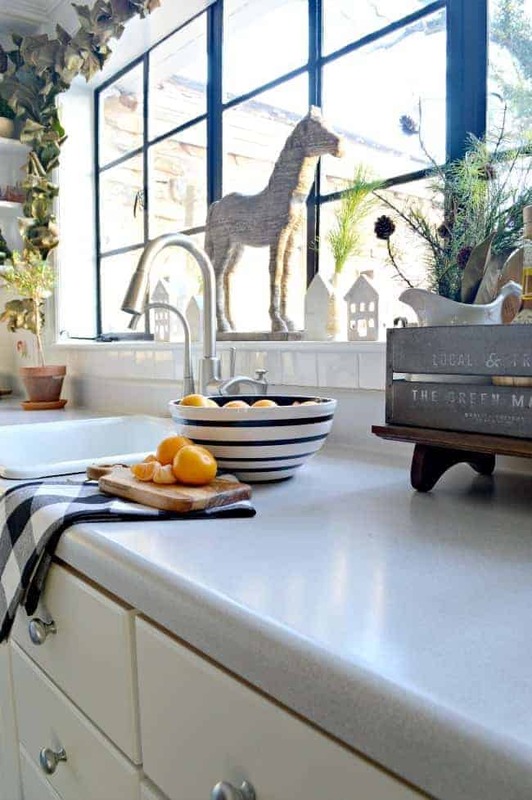 The windows over your kitchen sink are stunning Kristi! Every inch of your Christmas kitchen is beautiful. Thanks so much Tara, I appreciate it! I love your kitchen and you are right that window is awesome. If i had your kitchen i might set a stool down in front of that window. lol! As always you have set the bar high in decorating. I like your u cluttered style. Even though the \Magnolia leaves are drying they still look great. Have a blessed week. Thanks so much for your sweet comment Debbie. I love having the garland over the window but I’m still debating the magnolia leaves. I think it just needs a few tweaks if I do it again. What a beautiful space! I’m so jealous of that huge window in front of your sink! 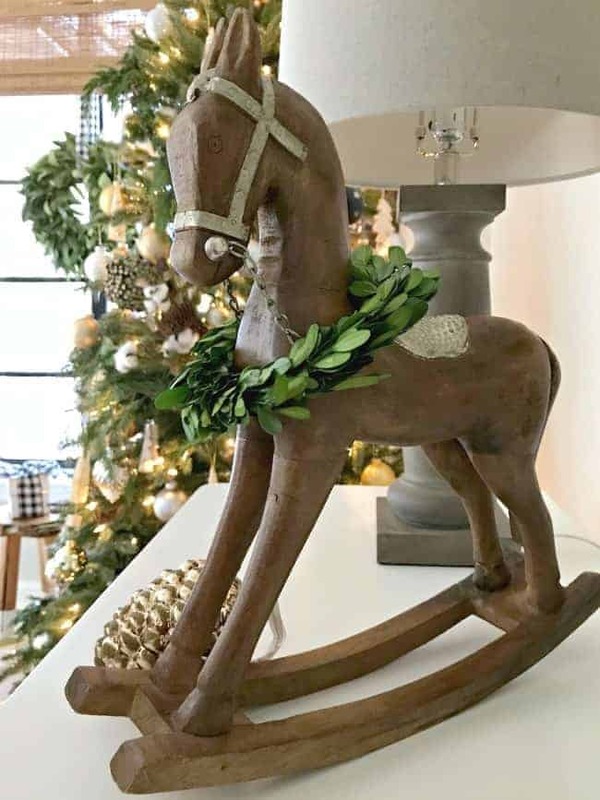 Your horses and wreaths have to be my favorite, but the whole space is gorgeous! Thanks so much Lydia, I appreciate it. I love having this space all decorated for Christmas. 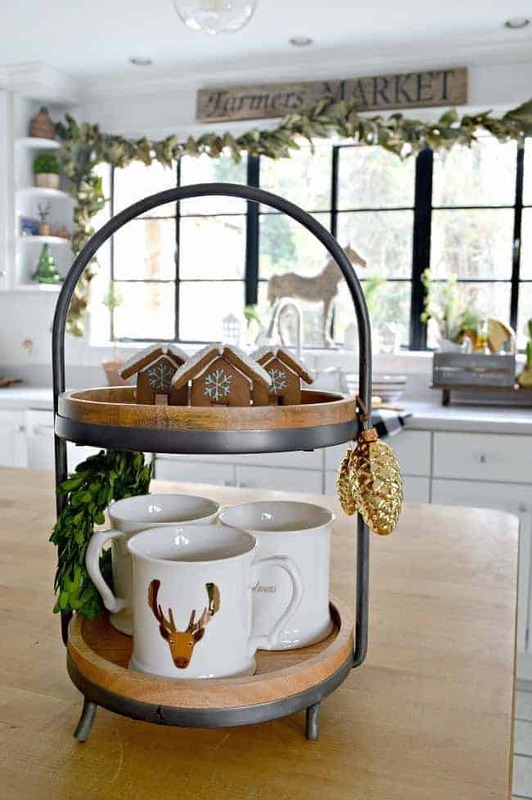 Kristi – Your Christmas Kitchen is gorgeous! You are absolutely right about the things that you don’t miss or need. Thank goodness you fought for that island though…it is so pretty. And don’t even get us started on that gorgeous, giant window! Your style and decor are simply beautiful and we love all of your person touches! Thank you so very much for touring with us. Wish you and yours a very Merry Christmas! Thanks so much Vicki and Jen for your sweet comment and for hosting this fabulous tour. 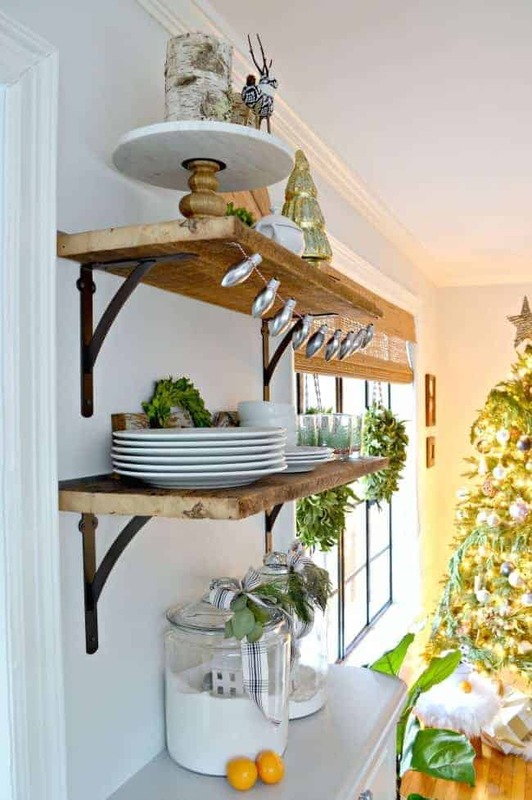 So many beautiful spaces and so much holiday inspiration. I’ve hosted tours too so I know how much work it is. Thank you again. Happy Holidays! I love it! Especially the house in the sugar? jar! Very creative. 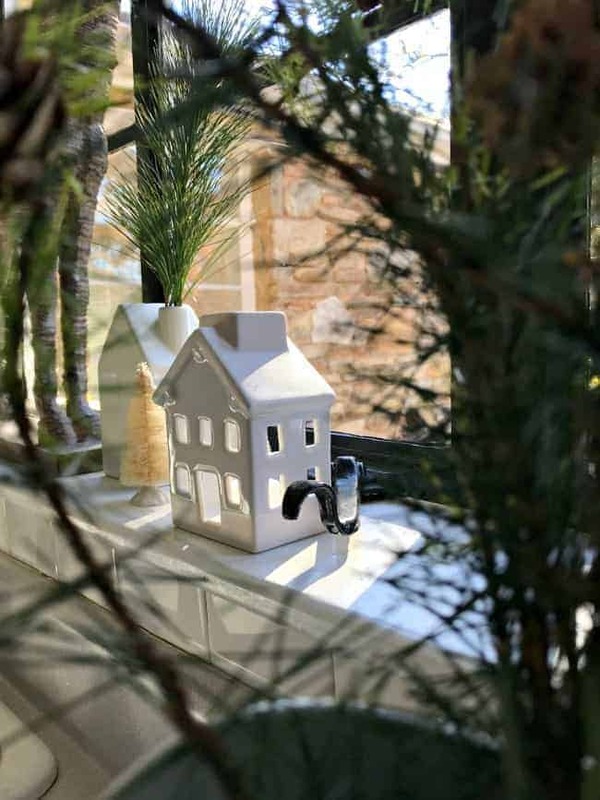 I’m so happy you are taking time to enjoy your little stone cottage and having such fun. Just fabulous! You really have the the perfect touch!! I need to see in person. That should have said MOTIVATED me enough! You have inspired me, now can you please also motivate me? The greens, I love them. I should have gone in the yard and gathered before it got cold, not sure I am inspired enough to put my mittens on! Your magnolia garland is awesome! It looks beautiful over the window. Thank you for sharing your beautiful kitchen with us!